Steve Liesman once again stunned me with his lack of understanding of matters economic today, when he commented that "in all recessions since 1970 at least the original part of it (recovery) has been jobless." Yes, Steve, but why is any of this a surprise? What part of this graph isn’t instantly obvious to anyone with more than two firing neurons in their head? That’s credit and population growth normed to a base of 1970. Population went from roughly 205 million to roughly 304 million during that time, a 50% increase. 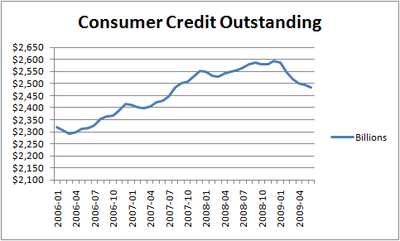 Outstanding consumer credit went from $128 billion to $2,525 billion, or a 1,973% increase – and this is only consumer credit, ignoring mortgages, financial firm credit, business credit, commercial real estate and of course government debt! Why are we not seeing "robust" economic growth when we exit recessions? Why is there no real hiring going on? Why can we not have a robust economic recovery? Why are we are replacing good jobs with "McJobs" that pay half as much – or less? And more importantly, where did all the "so-called prosperity" really come from, especially from 1994 on? In each and every instance of recession from 1970 onward we have "pulled forward" more and more demand and created fake "prosperity" through the creation of ever more debt that we have goaded consumers to take on. By doing so we have crippled the ability of the economy to grow, redirecting as much money as possible to a handful of people and firms (commonly known as "banks" and other "financial companies") instead of directing that effort and money into productive enterprises such as building cars, television sets and similar items. THIS time though the recession didn’t come from "ordinary business conditions"; it instead happened because the credit carrying capacity among both consumers and businesses hit the wall – they could no longer make the debt service payments and started to default. It began with "subprime" mortgages but that was nothing other than the first "hiss" of trouble out of the pressure vessel as the structural integrity of the fraud-laced credit system, where "capacity to pay" became a bad joke, had begun to disintegrate. We pushed the envelope of fraudulent credit creation and the sale of fraudulently-underwritten debt too far – and it blew up in our collective faces! Rather than admit complicity in the myriad Ponzi-style scams that underlay all of the financial system for more than thirty years (or have it shoved in their face) The Fed and financial "wizards" along with The Bush Administration (who was responsible for and complicit in refusing to fix the fraud during the 00-07 timeframe) chose to try to sweep it under the rug with "yet more liquidity" and "yet more lending." President Obama and his administration made a critical error after having won in November by refusing to stand up and take these scammers on face-to-face. He decided to instead continue and even accelerate the scam! It can’t and won’t work because the underlying issues have not been resolved and the bogus debt has not been forced out and defaulted – it remains clogging up the system, destroying the ability of the credit-intermediation system to function properly. Period. We have taken a measly 4.5% off the maximum outstanding credit amount (incidentally reached in January of this year) to date. 4.5%! That’s nothing – it is absolutely insufficient to return the system to normal functioning and restore sound economic growth – we need five times or more that much contraction! The bad news folks is that we will get that contraction, and if The Government and Fed do not force it to happen "voluntarily" we’ll get double that much – as much as a 50% decrease in outstanding credit – coupled with a deflationary credit collapse. The small crack in the market the last few days is a warning: The fraud-laced game is about up and we are running out of time to do the right thing. Stop listening to the media idiots – they have not and will not discuss this facet of the crisis because doing so means admitting that their corporate parents are a huge part of how we found ourselves in this mess, along with all the advertising they’ve stuck in your face for the last 30 years to "go on, buy now, pay later!" 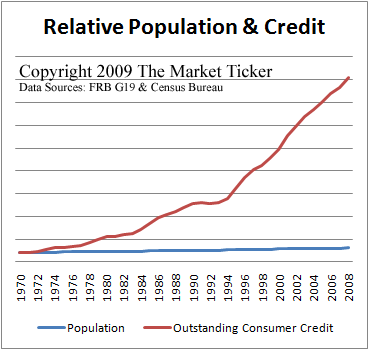 But irrespective of whether CNBC talks about it or not the mathematical reality of credit capacity as it relates to both population and earnings capacity is a mathematical reality. No amount of magical handwaving will change it, leaving us with only two choices: we either force the bad debt out into the open and default it, thereby shrinking both the balance sheets of banks and consumers (at the same time) or we continue to try to "press our bets" and take the risk of a second credit-system dislocation that will be far worse than what we experienced last fall and this spring. At present we are choosing path #2 – a river that is quickening in pace. Does anyone have an idea what that funny roaring noise around the next corner might be? This entry was posted on Wednesday, September 2nd, 2009 at 8:49 pm and is filed under Phil's Favorites. You can leave a response, or trackback from your own site.